As a member of the low brass family, I often find myself humming famous melodies that the back row does not ever get the chance to play. Ironically, the only thing missing from some of these melodies is the majestic sound of our gentle giants. As many of my low brass brothers and sisters would likely share this sentiment, it was time that these melodies were graciously set on our stands! 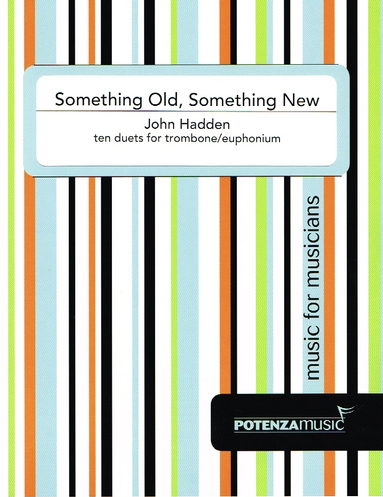 Something Old, Something New: Ten Duets for Trombone/Euphonium takes several of these legendary lines and alters them in all sorts of ways so that every low brass player may bellow out the classics. Of the set, half are completely original works and half are based on orchestral excerpts that musicians everywhere recognize and cherish. These short duets (most time in at around one minute) are all traditionally tonal and cover a variety of styles. Rhythmically, melodically, technically, and range-wise they are playable by intermediate level performers. The physical layout, paper quality, and printing are superb.